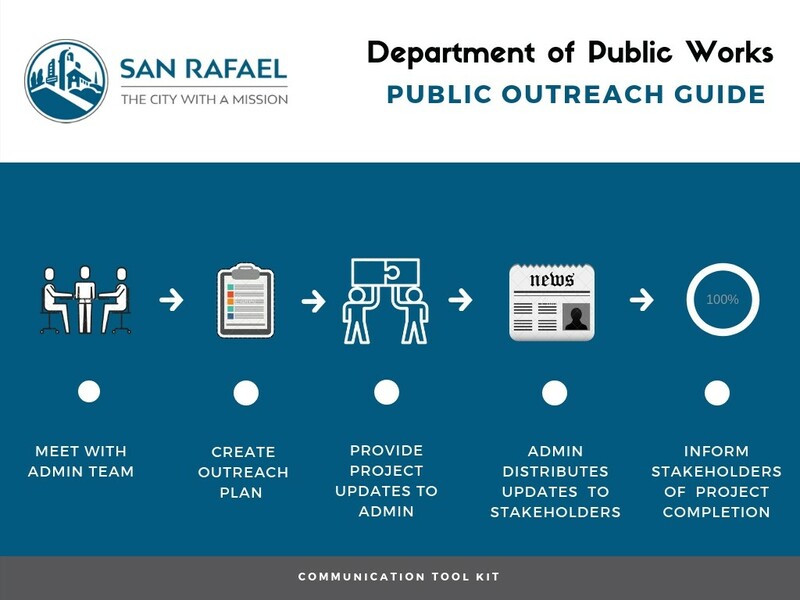 Enhance the City’s name by improving communication between City and San Rafael residents. The first step in project management is identifying stakeholders. Stakeholders will vary from project to project; they are a person or group of people who can affect and or be affected by the project. It is important to understand who needs what information and when or how often they need it. A communication strategy will gain continued support from those in favor of the project, while winning over those opposed. Poor stakeholder management can easily cause a project to derail. Creating a project webpage before the project design phase will create a home for all information regarding the project. Having a centralized location for the project description, construction timeline, and updates will assist in streamlining this information to project stakeholders. Project Description – The project description will highlight how and why the project was selected, a set of goals for the project, overall objectives for the project, as well as a project plan, and all project efforts to date (surveys completed, etc.). What should be included in an update? Project Summary - Include a short summary of the forecasted completion date and costs of the project. Be sure to include the tasks that are facing issues, how those problems might impact the deadline and costs, what you’re planning to do to resolve these issues and what the results will be once you have fixed the problem. Pictures of construction, workers, picture worthy project milestones, etc. Hold meetings near project sites or within impacted neighborhoods and after normal work hours so people have an opportunity to attend. If possible, provide snacks and childcare. Road/Lane Closures—Notify two weeks, one week, and a day in advance. Potential hazards in and around the work zone. Follow DPW's Projects In Action!